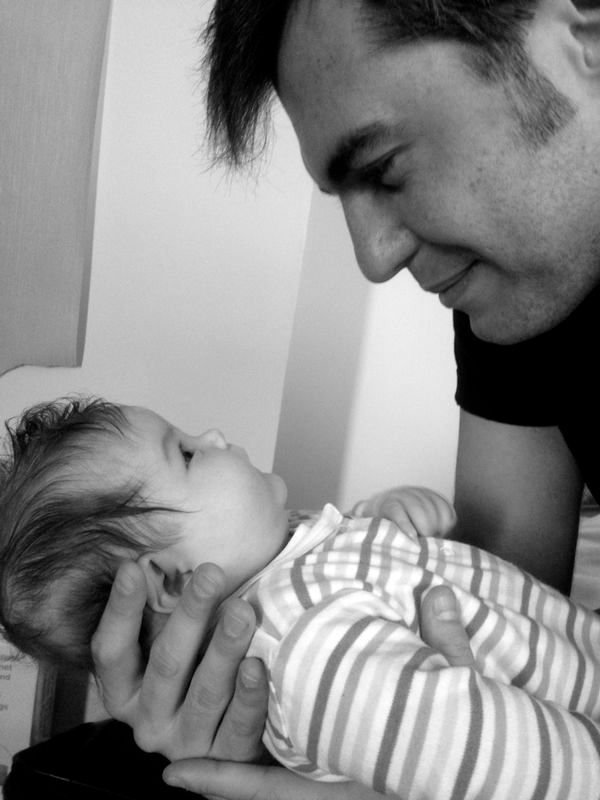 I, like many brave men before me, have just embarked on the biggest test of my manliness to date – fatherhood. Like most fathers, my first thought was that I was happy to be a “producer” – I have fulfilled my most basic human purpose: producing an offspring to continue the human race. I hope to produce more children to further continue of the human race, but, as I know it would continue with or without me, my simple hope is that one of my offspring will grow up to become be a world famous sportsman/woman, hugely successful businessman/woman, or…just someone that makes loads of money, and looks after good old mum and dad in their old age. Now, I love my wife, she is awesome and my best friend. I also love kids, they are very cute and make me laugh, but, like most men, I am worried about being a good Dad. My attention span is limited to say the least; can I stare adoringly at our child for hours without getting distracted? No. Will I get bored of Iggle Piggle and want to punch him in the face? Maybe. We have been blessed with a daughter who is, without doubt, the most perfect little creature I could have wished for. Putting aside the pregnancy (for another post, but involved telling my wife repeatedly she did not look like a whale, and an exorbitant mount of flatulence – blamed on the baby), I started the fatherhood journey happy, relaxed but slightly concerned about how on earth to look after a little person who can’t walk, talk, eat, clothe or bathe themselves, and who knows absolutely NOTHING. No knowledge, what so ever. But I decided to look at it as an opportunity to teach her all the things I know; a limited range of sports facts, drinking games (admittedly not handy for a few years), where to find the best pizzas in London, and directions to places). 1. Your wife is a natural mother and thinks of the baby first, so just do what she says. If she wants you to make a bottle for the baby, stay on target and make the bottle. Do not get distracted by washing up, getting other bottles ready, making yourself or her a drink, Sky Sports, going to the toilet, downloading the next episode of The Wire on Sky Go extra or Whatsapp. These can wait. Do it now. Trust me. 2. If you get the baby out of her cot first thing in the morning, change her nappy. A simple rule, but one you will feel like an idiot for forgetting “have you changed her?” – “No, maybe I should” – “well, her nappy is fuller than the BFG at an all you can eat buffet, so, yeah, maybe you should”. 3. You can try to find out what your baby wants by studying her like the Grand National Form book, or by listening to your wife. “She looks so tired! I am putting her down for a nap”. The response here is “yes, I was thinking exactly the same thing” (whilst trying to work out how she looks tired, as she looks fine to you). 4. Your little bundle of joy now is the boss. She dictates what you do. She may be a few hours, days, weeks, moths old, doesn’t matter, you now work for her. Your life revolves around her. So embrace it. 5. Bottled formula milk smells terrible, but in a weird way you will get accustomed to it. 6. You now sleep with some kind of lamp on, and will do so forever. 7. Babies do so many farts, and produce so much wind, it’s ridiculous (and very amusing). Maybe it was the baby’s fault you wished for a gas mask for 9 months during the pregnancy. 8. Know the limitations of your power. Your biggest strength is that you have arms and can carry stuff. Never ever overlook this, or think your remit goes beyond this. Your main job is to carry things to the car, back from the car, from one room to another. You are a carrier. This is what you do. Your mission is to get x amount of stuff (for 3 people this normally involves 5 – 7 bags full of various items, including the biggest bag containing your baby’s “stuff” – even though she is by far the smallest and her clothes use the least material) to a set location. This is where you can really go to town; go crazy! YOU get to control how you carry things and in what order. This is the one thing that is now in your control, so enjoy your freedom. 9. If you think you are tired, your wife is more tired, so never complain or expect sympathy. This counts if you are ill, have a cold, you are stressed as the baby won’t stop crying or you are stressed about work. Whatever you think you feel, your wife will feel it more but generally not complain. So do not waste your time. 10. Last, and my biggest tip of all. Never, ever, and I mean ever, come home, look around and say “what have you been doing all day?”. Golden rule number 1. And it sounds so simple! You will not always come home to a happy smiling baby, laughing wife, washing done, dinner made, house cleaned, so never expect it or wonder why. Soon you will have the baby on your own for a day, and if you manage to leave the house you have done well. Even if you didn’t mean it the way it came across, this one sentence is one you should never, ever say. Practice saying it now. Go to the mirror so you can see your lips move and hear the sentence out loud. You have proved you can say it. Now completely delete it from existence, because if you do say it, no matter how much you have followed rules 1 -9, I promise, you will regret it………..